Contrary to popular belief, the U.S. Constitution does not instruct the states on how to select presidential electors. Rather, this is a power reserved to the states that has been used in many different ways over the history of the nation. Electors have been elected directly without relation to a presidential candidate, selected by state legislators, elected by district, and as is currently the case in all but two states (Maine and Nebraska), elected statewide in winner-take-all slates. The U.S. Supreme Court has ruled in multiple cases that the state’s power to choose the manner of selecting electors is “supreme,” “plenary,” and “exclusive.” Early in our history, several states (including Massachusetts and New Hampshire) cancelled presidential elections when they were concerned that the “wrong” candidates would be selected, and instead the legislature appointed the electors directly. States currently have the power to award their electors to the winner of the national popular vote, although this would be disadvantageous to the state that did this unless it was joined simultaneously by other states that represent a majority of electoral votes. 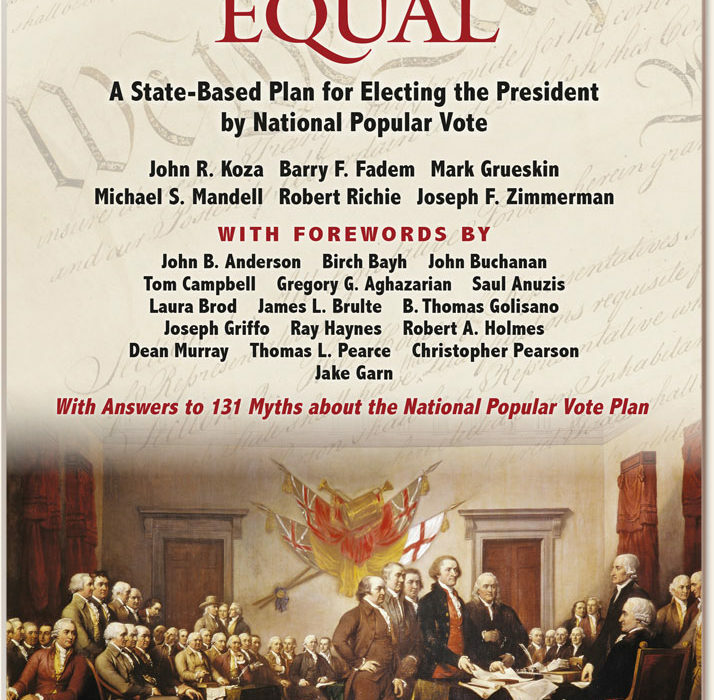 Hence the National Popular Vote plan is an interstate compact—a type of state law authorized by the U.S. Constitution that enables states to enter into a legally enforceable contractual obligation to undertake agreed joint actions, which may be delayed in implementation until a requisite number of states join in. There are more than a thousand interstate compacts, and each state in the United States belongs to dozens of them. The U.S. Supreme Court has authorized electoral compacts in “dicta” and several other electoral compacts have been proposed in the past. Under the National Popular Vote plan, the compact would take effect only when enabling legislation has been enacted by states collectively possessing a majority of the electoral votes— that is 270 of the 538 electoral votes. Once effective, states could withdraw from the compact at anytime except during the six-month window between July 20th of an election year and inauguration day (January 20th). To determine the National Popular Vote winner, state election officials would simply tally the nationwide vote for President based on each state’s official results. Then, state elections officials in all states participating in the plan would choose electors sworn to support the presidential candidate who received the largest number of popular votes in all 50 states and the District of Columbia. The winner would receive all of the compacting states’ electoral votes plus additional electoral votes from whatever non-compacting states happened to be carried by the nationwide winner. Thus, in practice, the presidential candidate receiving the most popular votes nationwide would typically receive about three-quarters of the electoral votes. Delaware Legislators will introduce Legislation in March. Please contact your legislator and ask them to support this important legislation. Delaware Common Cause and Common Cause National are working to help make sure every vote is equal and invite you to join us in this effort in our State.